Perhaps you knew this already, but Mandy and I just bought a new home. As our kids get older, we were rapidly outgrowing our current home, so we are excited to be in a home that we can live in for the next 10-15 years. You also might know that I’m pretty passionate about neighborhood ministry—often called Parish Ministry—where you take seriously the geographical location in which God has placed you and seek to be good news and a faithful presence of blessing in that place. So, naturally, this process of moving to a new neighborhood has me thinking a lot about parish ministry. We tried to be intentionally invested in our place at our former house, through hosting some events for those on our block and in our vicinity. But I was surprised by the number of transient folks on that street—college students and short-term renters. Combined with the fact that we only lived on that block for 5 years, and that means that we weren't as communal and neighborly as we would have hoped to be when we first moved in. Which has me dreaming about what could be as we have moved from Annie Street to Mountain Ash Avenue. Who lives here? What demographic are they? What are our neighbors like? Will we like them? What needs can we help meet? Who will we connect with in deep ways? But, more importantly, this move has me dreaming and scheming about practical and actual ways in which my family might be intentionally pastoral in our new location. How will we purposefully engage with our neighbors? How will we make our presence known and felt in positive ways? How will we strategically get to know our neighbors so that we can be the good news and share the good news? Some of the ladies at our church are currently reading a book called The Turquoise Table, about a woman who purposefully placed a turquoise table in her front yard and intentionally looked for activities and events that could get her neighbors to her turquoise table in order to be communal, welcoming, and hospitable with them—the way Jesus would have been. And I fervently believe we are all called to this sort of relational ministry with our neighbors. So, what’s your ‘turquoise table’ idea for connecting with, and loving, your neighbors? How could you be more intentionally and faithfully present on your block this summer? Who, in your physical proximity, is God inviting you to connect with that you still never have? What parish ministry is God calling me and my family into on Mountain Ash Avenue in this next season of life? It will take some effort. It will take some creativity. It will take some time. And perhaps even some money. 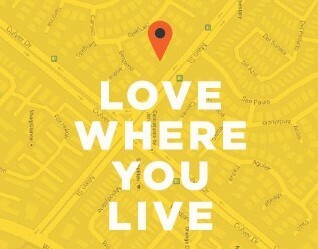 But loving our neighbors is at the heart of the gospel, so let’s commit to taking this part of the Great Commandment seriously. Let’s commit to this being the summer where we finally meet our neighbors and seek out ways to be a loving presence where God has placed us.